Wonderful morning pick up to join our breakfast with Lion + Atv ride tour with visit Bali Safari & Marine Park and join the Atv tour. This trip takes us to your hotel in Bali and takes you back to Bali Safari & Marine park, our first destination of the day, for a lion package breakfast and a combined excursion. Many visitors want to combine breakfast and sightseeing in Bali. Here we share one after another and you can choose which one you like to do. Morning start from your hotel to Bali Safari Marine Park Breakfast Bali, and enjoy a new Bali Safari Marine Park program and is an exciting breakfast experience you won’t find elsewhere in Bali where you can enjoy wildlife, e.g. lions in the natural surrounding area. Bali marine Park Lions ‘ breakfast is the first African restaurant in Asia to dine with a splendid pride lion, and we prepare it at Tsavo Lion restaurant. A lion of our pride accompany your breakfast while you enjoy delicious cuisine, securely secured with full – sized glass panels, at the Tsavo Lion restaurant. You can’t find any other dining experience in Bali where you can dine and witness wildlife in their natural habitat. Tsavo Lion Restaurant is Asia’s first African restaurant to dine with majestic lion’s pride. 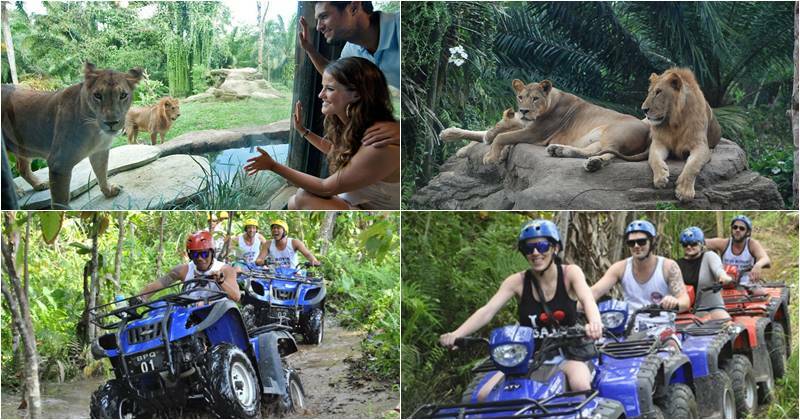 Then tour continue to have atv / quad ride; Bali ATV Ride or Quad Bike offers an exciting tour of the island of Bali. Before riding the rice fields, plantation, the bamboo , jungle, river, villages and picturesque panorama our experienced instructors will give you a full security briefing. If you want more of a challenge, our instructor will guide you in some of the most technical field on our site. The inner part of Bali by exploring the hidden beauty of the island in a way you’ve never done before. Experience the excitement of driving a powerful 250 cc ATV in the center of Bali’s most amazing countryside. Bali ATV Ride activity is a daily tour, dry or raining season, the challenge depends on your predilection. Do you want to go back to nature while you enjoy your adrenaline on a quad? Let us therefore join in and create the unforgettable memories and experiences for 1,5-2 hours for your exotic vacation in Bali. 17.00 – Transferred back to your hotel. Atv ride for 1,5-2 hours trek. Extra dry cloths, Short or long for atv ride, socks if any , Sun lotion, insect repellent, camera and extra cash for extra drinks or souvenir.